Dean Forward was the big winner in the final two races of the HSCC Historic Formula 2 FIA-sanctioned International Series at Dijon in France (7/8 October). Forward’s March 782 swept to a commanding double win and that result earned him victory in the class championship, the Bruno Giacomelli Trophy for 2-litre F2 cars from up to 1978. Prior to the Dijon races, Richard Evans looked the likely winner in his March 742 and he took pole for the opening race from Forward. However, when Evans retired from the lead in the first race with engine and suspension problems, his weekend was over. Instead, Forward went ahead to claim his first historic single-seater championship class title and, fittingly, won the Giacomelli Trophy in the type of car once raced by the Italian F2 ace. However, his margin in the category was only four points as Michael Bletsoe-Brown (Chevron B27) had a strong weekend at Dijon. Frenchman Robert Simac had already been confirmed as winner of the Jochen Rindt Trophy for 1600cc cars, but he still wrapped up his season with another excellent weekend. On his home track, Simac finished fourth overall in the first race behind Hans Peter (Ralt RT1) and Marc Devis (March 782) and then move up to second in the later wet race when Peter and Devis did not start. 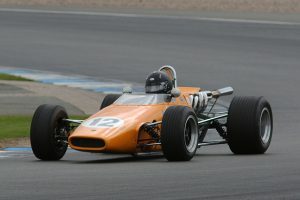 In the Gilles Villeneuve Trophy for 1600cc Formula B and Formula Atlantic cars, Frenchman Olivier Huez (March 722) was confirmed as the class champion, while Stephen Weller (Elfin 600B) underlined his class championship title in the Jim Clark Trophy for the early non-winged F2, Formula B and Formula Atlantic cars. The two races at the former Grand Prix venue wrapped up a tremendous season for the HSCC Historic Formula 2 FIA-sanctioned International Series, with 40 drivers scoring points across 10 races. The season was typified by fine racing in superbly-presented cars in a sporting and social atmosphere. Plans for the 2018 season are well advanced and more cars and drivers are already confirmed to join the grid. Running alongside the Formula 2 races at Dijon was the final event for this season’s HSCC Pre ’80 Endurance Series where the mighty Cosworth DFV-powered Lola T282 of Leo Voyazides and Simon Hadfield completed an outstanding season with two more victories. 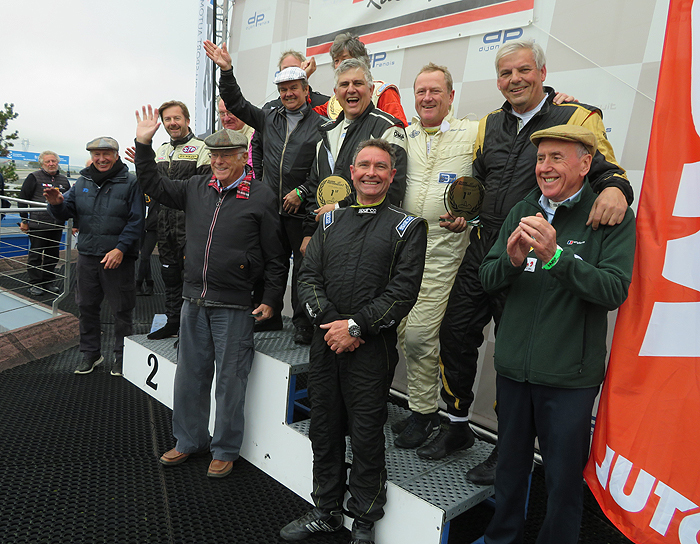 Other visitors to the podium across the pair of races were Mark Richardson/David Gathercole (Lola T290), Andrew and James Schryver (Chevron B26) and Kevin Cooke (Royale RP17).